PRODUCT: SIEVERT #7004-00, 14 OZ COPPER HAMMER BIT, 5.12" PYRAMID POINTED SOLDERING TIP. PRICE/EACH. DESCRIPTION: REPLACEMENT PROPANE SOLDERING BIT / TIP. FITS SIEVERT PROMATIC, 7003, SIK, AND LSK SERIES PROPANE SYSTEMS. Sievert #3370-37 Soldering Iron Handle Assembly. With Promatic Universal Handle, Titanium Burner, Wind Shield, Piezo Ignition and Stand. Fits 7003 - 7005 Copper Bits (not included). Price/Each. SIEVERT LSK1-10 PREMIUM SOLDERING IRON KIT, WITH #3366 PROMATIC UNIVERSAL HANDLE SOLDERING IRON, 7003-00 SOLDERING BURNER & WIND SHIELD, STAND, #7003-50 14 OZ. 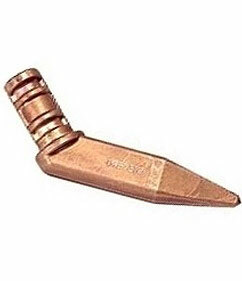 DIAGONAL COPPER BIT, 10' UL LISTED HOSE, 3091-23 UL PRESET LP REGULATOR. PRICE/KIT. Sievert #SIK2-04 Premium Propane Soldering Iron Kit with Bag. Kit includes Sievert Promatic Universal Handle with on/off ignition, soldering iron, 14 oz Pyramid bit, 4-foot hose with regulator assembly, canvas carrying bag. Price/Kit.